Nagpur, Metro Rail News: Right since its inception, Maha Metro had envisaged the need for reducing hassles faced by commuters while travelling through Metro. It was this concept, which prompted the Organization to introduce an all-in-one co-branded “MAHA-CARD”. This Card caters to both commuting as well as daily needs within the city. 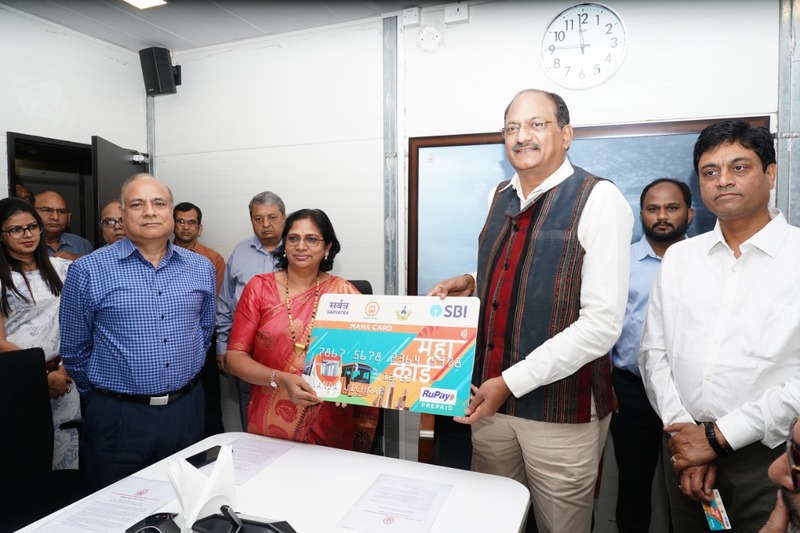 Maha Metro joined hands with Nagpur Municipal Corporation (NMC) and State Bank of India (SBI) to bring them onboard for the common mobility program. As Maha Metro Nagpur gets ready for launch of its services, the first Maha Card is being presented to City mayor and Nagpur’s first citizen Smt Nanda Jichkar at the hands of MD Dr Brijesh Dixit, today. As Nagpur takes huge steps in overall development, the initiative of “MAHA CARD” is a revolutionary step towards placing the city of Nagpur at par with its international counterparts. It is an all-inclusive, user-friendly approach that will increase the efficiency and mobility of everyday transactions. Maha Card was unveiled at the hands of Chief Minister Shri Devendra Fadanvis, Union Minister Shri Nitin Gadkari, SBI Chairperson Arundhati Bhattacharya and other dignitaries at a glittering ceremony held during the inaugural trial run on 30th September 2017. With Maha Metro Nagpur gearing up to launch passenger services, the Card is now being shared with the common public of the city. Single card for Metro, Buses, Feeders, Parking, Utility and other retail payments. Highly secured Chip based dual interface (contact and contactless) smart card. Dip and swipe interface for retail operations. Personalized card on proven EMV (Europay, Master, Visa, Rupay) platform. Automatic fare collection system implementation work was awarded to SBI Consortium comprising State Bank of India, M/s S. C. Soft Pte. Ltd. and M/s Aurionpro Solutions Pvt. Ltd on 12th April 2017.The contract is based on BOT (Build, Operate, and Transfer) model where the consortium will bear the upfront Capital cost and will maintain the system for 10 years. Share from other transit and non-transit transactions. Promotion/ discounts and loyalty rewards for increased customer acquisition. In win-win situation customer is the ultimate winner. The AFC System and MAHA CARD, which have been embraced by Maha Metro Nagpur would go a long way in making commuting not just simpler, but would also ensure that the Metro train ride becomes hassle-free for every passenger.